37192 1 year ago Enny Cramer Philadelphia, PA , US War is Hell and useless. 37186 1 year ago Andrew Kuhn rochester, NY , US war isn't any good. there are no winners of war, only losers. there are no good war. I consider war hatred. hate doesn't push away hate. only love pushes away hate. I want world peace. 37184 2 years ago yasmin solomon gualala, CA , US Use the money for the way over-inflated military budget for THE PEOPLE, especially THE POOR PEOPLE! 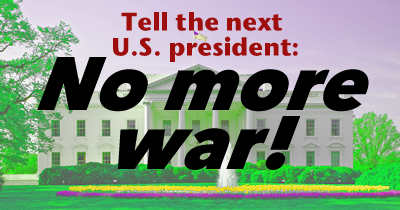 NO MORE WARS, EVER. ENOUGH!!!!!!!!! !